The Chamba, whose number today is estimated at 20.000 live south of the Benue River. The Chamba use a type of mask that symbolizes a bush spirit. The mask has a rounded head with a flattened open mouth and two large backward-sloping horns. From the helmet a muzzle projects forward and horns project backward in a single horizontal plane. The hemispherical dome of the Chamba mask is related to death, for it is said to be like a skull, an ancestral relic taken from the grave of an elder. Other features are related to the wilderness: the open jaws are the jaws of the crocodile, the horns are those of the forest buffalo. The wearer looks through an opening between the two jaws. The mask is linked to dangerous forces. These masks are either female (painted black) or male (painted red). The female mask is often explained as a reminder of their origin. According to the story, a young buffalo/beautiful girl removed its animal skin to take a bath. A passerby saw her, hid the skin, and married the girl. 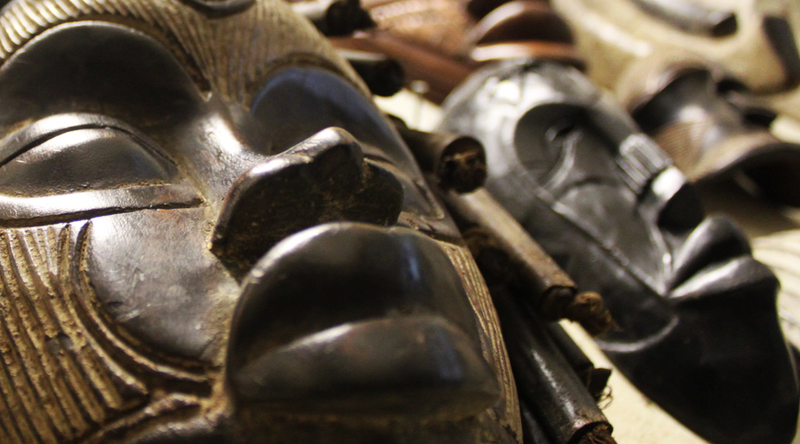 These masks perform at rites of passage: circumcision, chiefs’ installations, and diverse funerals. They express the powers and dangers of the bush, where they are stored and from which dancers come, as well as the conjunction of these powers with the spirits of the dead.Chamba figures are rare and their function uncertain.